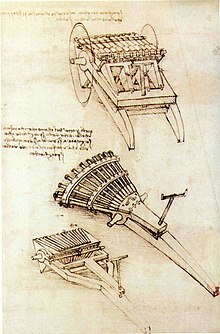 A drawing of ribauldequins, as designed by Leonardo da Vinci. A Ribauldequin, also known as a rabauld, ribault, ribaudkin, infernal machine or organ gun, was a late medieval volley gun with many small-caliber iron barrels set up parallel on a platform, in use during the 14th and 15th centuries. When the gun was fired in a volley, it created a shower of iron shot. They were employed, specifically, during the early fifteenth century, and continued serving, mostly, as an anti-personnel gun. The name organ gun comes from the resemblance of the multiple barrels to a pipe organ. The first known ribauldequin was used by the army of Edward III of England in 1339 in France during the Hundred Years' War. Edward's ribauldequins had twelve barrels which fired salvoes of twelve balls. Nine-barreled ribaults were used by Milan and other participants in the Italian Wars. Ribauldequins were also used in the Wars of the Roses. During the Second Battle of St Albans, Burgundian soldiers under Yorkist control utilized the weapon against the Lancastrian Army led by Queen Margaret of Anjou. 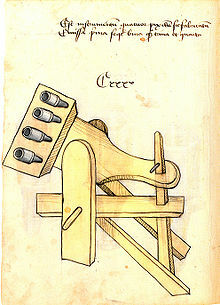 In Eastern Europe, a heavier version of the organ gun was used by Stephen the Great of Moldavia as late as 1475, as attested to by Polish chronicler Bielski. ^ J. F. C. Fuller (1987) . A Military History of the Western World: From the earliest times to the Battle of Lepanto. 1. Da Capo Press. p. 469. ISBN 978-0-306-80304-8.